Shuttle commander Karol "Bo" Bobko and station spacewalker Lt. Gen. Susan Helms are flanked by their fellow Hall of Fame astronauts at their induction ceremony, May 7, 2011 at the Kennedy Space Center Visitor Complex. The U.S. Astronaut Hall of Fame added two more to its ranks Saturday, inducting a space shuttle commander who flew two orbiters' maiden flights and a spacewalker who set a duration record working outside the International Space Station (ISS). Karol "Bo" Bobko and Lt. Gen. Susan Helms were the guests of honor at the induction ceremony held at NASA's Kennedy Space Center Visitor Complex in Florida, home to the Astronaut Hall of Fame. 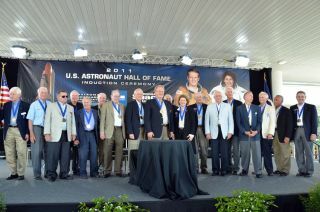 The event brought together more than 15 of the Hall's 77 previous inductees, including Mercury astronaut Scott Carpenter, moonwalkers Charles Duke and Edgar Mitchell, and first space shuttle pilot Bob Crippen. "Her incredible talent and leadership ability became quite evident to me during her first flight, STS-54 on which she served as an IV, or intravehicular crew member, with the responsibility for overseeing the conduct of the spacewalk on that flight," Bolden recounted for Helms' family, fellow astronauts and the public guests attending the ceremony. "Having trained as an IV crewman myself, I watched in awe as she set the standard for IV crew members by the manor in which she perfectly and deftly choreographed the spacewalk." "Under her direction, we learned many lessons that would prove key to the construction of the International Space Station," said Bolden. Like Helms, Bobko also set Air Force records, becoming the first graduate of the Air Force Academy to be selected to train as an astronaut and to fly in space. Chosen for the Air Force's Manned Orbiting Laboratory, he transferred to NASA's astronaut corps in 1969 after the military space station program was canceled. Ultimately, Bobko had to wait 14 years to make his first of three spaceflights. "Bo loved spaceflight. He wanted everyone working with him to enjoy it as much as he did and he knew from experience that despite delays, a first flight is worth waiting for," said 2007 inductee Jeffrey Hoffman. Hoffman flew with Bobko on STS-51D, between Bobko's two other space shuttle missions, the first flights of Challenger and Atlantis. "Bo is cool under pressure, and I saw this on numerous occasions, the first of which was right after main engine cutoff," said Hoffman, recounting a hydrogen fuel dump procedure that Bobko and his STS-51D pilot Don Williams were tasked with performing after space shuttle Discovery reached orbit. The dump immediately caused the orbiter to roll about 90 degrees out of attitude and led to almost constant firing of its control jets. "People who have experienced these know how loud they are," said Hoffman. "I mean I was a rookie down on the middeck and I thought I was in the middle of an artillery barrage." "Don's voice from up on the flight deck seemed about an octave higher as he asked Bo quickly 'Should we shut the valves!?!' Bo just said, perfectly calmly, 'Nah, let's leave them open and see what happens.'" "Of course we survived," said Hoffman, "and I think we succeeded in demonstrating that this was maybe not an optimum technique for dumping the hydrogen." Continue reading at collectSPACE.com for a Q&A with new Astronaut Hall of Fame inductees Karol "Bo" Bobko and Lt. Gen. Susan Helms.